Most people mistakenly believe that the Cadillac Invoice Price reflects what the dealer paid for a new vehicle - The true Dealer Cost. It is not! Car shopping can be a very confusing endeavor. Below is a list of terms you are likely to hear while car shopping, and a short description of how these terms affect the price of a vehicle. Knowing these terms will make car shopping easier, and may even result in being able to negotiate a better deal. The Manufacturer’s Suggested Retail Price (MSRP) is a manufacturer’s recommended retail selling price of a vehicle. The MSRP does not include all fees and charges, which will raise the price quoted to a customer. The MSRP does not include rebates and incentives that can lower the price quoted to a customer. Car shoppers should know that the MSRP is negotiable. The dealer invoice price is the amount the dealer must pay to the auto manufacturer for a specific car and all the associated charges. Dealer holdback is a percentage of the MSRP that a manufacturer holds in an account for a dealer. 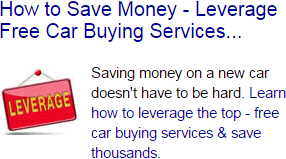 This money is eventually paid to the dealer, and is considered a dealer discount that lowers the invoice price. Manufacturers hold on to this money to ensure that dealers have enough money to pay their employees and other operating expenses. Manufacturers often offer incentives and rebates to customers in an effort to increase vehicle sales. An incentive or rebate is an amount of money paid to a customer by the manufacturer for purchasing a vehicle. Typically, customers sign these over to the dealer, who discounts the vehicle in the amount of the rebate or incentive. Destination fee is the delivery charge that a manufacturer charges a dealer to ship a vehicle to the showroom from the factory. Most vehicles are shipped from the factory by boat or rail, and then by truck to the dealer, and the destination fee represents all these costs. Manufacturers from time to time offer incentives to help dealers sell vehicles An incentive is an amount of money paid to a dealer by the manufacturer for selling a vehicle. Dealer incentives are not usually known to the customer, therefore a dealer can choose how much, if any, of the incentive to apply to the vehicle’s price. Most dealers are members of a regional advertising group. The regional advertising group runs advertising for a specific car or car line, but not for a specific dealer. Dealers must pay this fee to pay for their portion of this advertising. 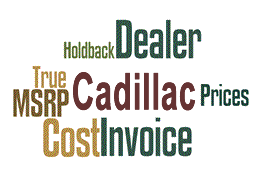 Base Cadillac Invoice Price + the dealer Invoice price of Options + Destination - Holdback = Total Dealer Cost.